The digital switchover affects only TV services - at present there are no plans to change or remove FM radio. Although DAB is promoted as being the digital alternative to FM, many people still use (and prefer) FM radio. With the digital switchover for TV, part of the same frequency spectrum will be used for the Freeview service. DAB doesn't use the same frequency spectrum as FM radio, and both services use considerably less spectrum than TV since there is no video content. FM provides a small number of high quality analogue stereo radio programmes, provided by a conventional transmission network across the country. Transmitters in different reception areas are on different frequencies to avoid interference, which typically gives several tuned responses for each of the main BBC stations. Even local radio stations may be present at two or three positions on the dial. One of the issues with FM radio is the need to re-tune when travelling in a car, to maintain optimum reception. FM transmissions in the South-West primarily come from North Hessary Tor (close to the prison at Princetown on Dartmoor). The BBC radio transmitters web page shows the main transmitter locations. Clicking on one of these shows the associated relay transmitters. For North Hessary Tor, this includes Beacon Hill, which uses slightly different frequencies. Although the transmitter at North Hessary Tor is high power (160kW), the signal from Beacon Hill (1kW) typically provides a stronger signal in Torbay. One factor that makes a significant difference to the FM received signal power is the polarisation of the FM aerial. North Hessary Tor transmits "mixed" polarisation, which means it transmits both horizontal and vertical polarisation at the same time. 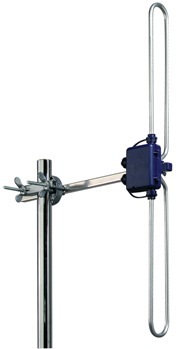 To receive this, the FM aerial can be correspondingly mounted either horizontal or vertical (or indeed slanted). The polarisation from Beacon Hill is vertical only - hence a horizontal aerial will pick up signals from North Hessary Tor, but a vertical aerial will pick up the stronger signals coming from Beacon Hill. Beacon Hill transmits all the main BBC radio programmes, but it doesn't transmit Classic FM. This signal has to come from North Hessary Tor, since that's the nearest transmitter that carries it. In terms of the optimum orientation for an FM receiving aerial, horizontal polarisation gives better signals from NHT's mixed polarisation signals (at least in the location used for this test). The local radio stations work better with vertical polarisation, which also gives higher signals on the main stations (coming from Beacon Hill). Although a vertical aerial appears to work slightly better, an FM aerial is easier to mount on a vertical mast if it has a horizontal polarisation, since the mast itself doesn't interact with the dipole. Mounting an FM aerial in the loft can be a viable option. Since the FM frequencies are significantly lower than TV, they diffract better around obstacles (so are less affected by terrain) and are attenuated less by roof tiles (<2dB for roof tiles, provided they have no significant metallic content - some concrete tiles can have a much higher loss). 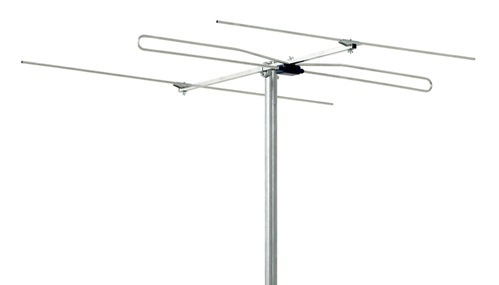 A foil lining (e.g on roof insulation) will however completely shield the signal, and require the aerial to be mounted outside. DAB radio stations have the same frequency at all transmitters across the whole of the UK. This is possible because of the COFDM digital transmission format, which enables the use of a "single frequency network". This is an advantage in principle for car radios, since re-tuning isn't be required. One of the issues with DAB currently is that sufficient transmitters to provide optimum coverage aren't yet available, so the take up of DAB (including car radios) hasn't been high. Another issue with DAB is audio quality. At the outset, DAB stations were allocated a high data rate giving excellent sound quality. More recently, this bandwidth has been reduced, with the sound quality suffering accordingly. The digital radio offered on satellite transmission currently has a better quality than DAB. The DTG recommendation for DAB signal strength is 30dBµV to 65dBµV, with a C/N ratio of at least 18dB. In Torbay, the DAB signals are transmitted from both Beacon Hill and North Hessary Tor, and can acheive levels of around 70dBµV. N.B. Although BFBS, theJazz and Capital Life show up in the list of available stations on a DAB radio, they seem to have stopped transmitting, so selecting any of these results in silence. Each MUX in DAB has a width of 1.536MHz, and is capable of carrying 4 or 5 high quality radio stations (at a data rate of 256k), or 10 low quality radio stations (at a data rate of 128k). 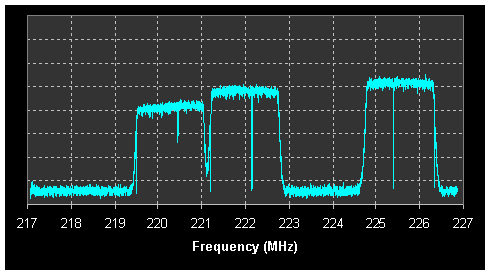 The MUXs are separated from each other by a guard band, which is mostly 0.176MHZ, but not always. Very few MUXs are used. The MUXs that are used are close together. Some of the services are in mono. Some services use a higher bit rate than others. Compared with FM, the usage of the DAB frequency spectrum looks odd - out of a sizeable frequency allowance, only three MUXs are being used; the rest is empty. This appears to have something to do with the cost of setting up DAB services, and may also explain why there aren't more programmes available yet. The MUXs that are used are close together and are well "filled". This also appears to be related to the cost of establishing a DAB service - the stations that are provided haven't been allocated a sufficiently high bit rate to give the best audio quality, hence many hi-fi listeners may prefer FM radio. The current concerns with DAB audio quality are likely to remain until DAB+ is introduced. This uses a different audio compression method that isn't compatible with older DAB radios. Both services will continue for a while, but eventually everything is expected to become DAB+ only. Anyone thinking of getting a DAB radio should make sure it has DAB+ capability. These MUXs appear to be a sub-set of the 10A, 11A and 12A MUXs. The exact purpose of these MUXs, and why they've been added, is a bit of a mystery - when I find out I'll add a note here!